The 2019 Hansen Musical Arts Series presents baroque ensemble Apollo's Fire in "A Night at Bach's Coffeehouse." Rene Schiffer, cello, and Alan Choo, violin, from the ensemble will present a master class for our BGSU string students. This session is also open to the public. 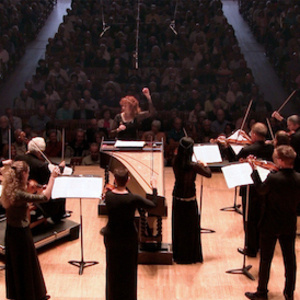 As performed in sold-out concerts at Carnegie Hall, Tanglewood, and the BBC Proms, "A Night at Bach's Coffeehouse" presents Apollo's Fire in music of J.S. Bach and his most admired colleagues. Inspired by the lively coffeehouse concerts led by Bach in 18th-century Leipzig - fiery strings and colorful recourders...it's an evening of rampant virtuosity! Named for the classical god of music and the sun, Apollo’s Fire was founded by its Artistic Director Jeannette Sorrell, to revive the baroque ideal that music should evoke the various Affekts or passions in the listeners. Apollo’s Fire is a collection of creative artists who share Sorrell’s passion for drama and rhetoric. Learn more about this exciting group! We welcome Apollo's Fire for a Hansen Musical Arts Series residency, February 5-7. Their performance on February 6 is free of charge, and open to the public. For a full schedule of residency activities, please visit our website.